Techstory and Fundtonic are hosting Pune’s biggest startup festival. This event called #Hustle will see entrepreneurs, investors and infleuncersfrom Pune, Mumbai and Ahmedabad come down to our very own Pune city. Startup Street : 1pm – 6:30 pm. Panel Discussion : Future of Large Web and Mobile Businesses India, applications of AI, Voice and Investment outlook. The event will have 50+ very known investors from Pune, Mumbai and Ahmedabad come to this event. The event will also have a startup street where 20 startups will display their products for the entire day. 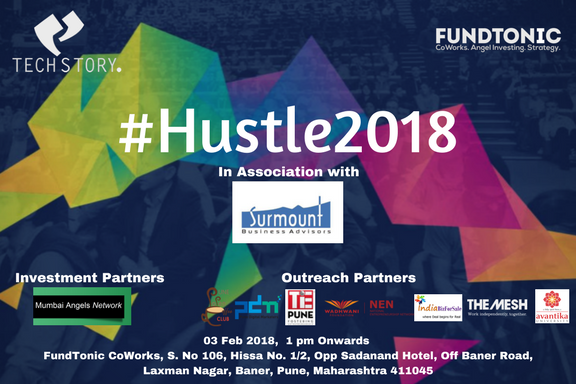 The post #Hustle2018 – What to expect at Techstory & Fundtonic Event in Pune appeared first on TechStory.